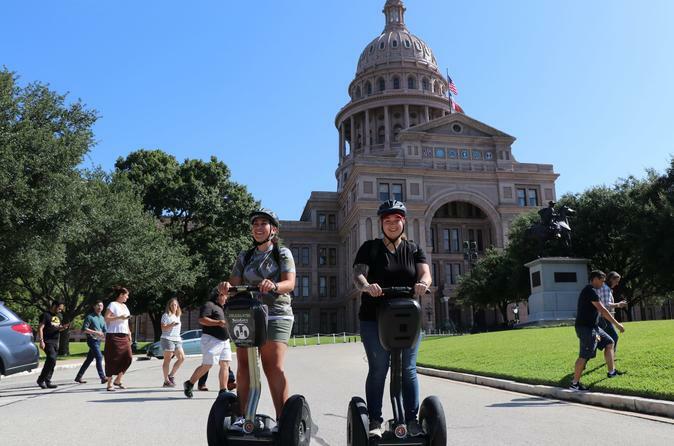 Enjoy a historical 2-hour Austin tour, these Segway tours are led by enthusiastic experienced tour guides. Your adventure will include historical information with a focus on the State Capital of Texas, the Driskill Hotel, the 6th Street entertainment district, Congress Avenue and more. This tour offers a visit, a break where you get to go inside the Driskill Hotel and inside the State Capital building. This experience starts out with a friendly orientation and one-on-one Segway rider training. You will get to explore the Texas State Capitol Building grounds at night on an Austin Segway Tour. Glide around the Texas State Capitol Building and explore much of the downtown as the sun starts to set. Then, your tour guide will lead you into the core of downtown via Congress Ave. Austin is a city known for its nightlife, so on this Segway tour, you will get a chance to visit downtown Austin’s live music areas and learn about some of Austin’s haunted past. You will see famous sites including the Moon Light Towers –and hear a story about of one of America’s first serial killers (was Jack the Ripper really from Austin?). Along the way, you will visit a part of world famous 6th street just as the music venues are getting going, and your tour will hear about the haunted and historic Driskill Hotel. Your Austin Segway tour will then visit one the old warehouse district transformed into a shopping district. Enjoy beautiful views of our Austin skyline at night from Lady Bird Lake.